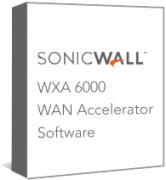 The SonicWall WXA 6000 Software with 1yr Subscription and 24x7 Support delivers powerful WAN acceleration to demanding networks. Suitable for networks of up to 2,000 users and capable of accelerating and de-duplicating up to 10,000 concurrent sessions the software installation is designed to be deployed on a Dell PowerEdge server. The solution also supports use of the WXA client, allowing traffic between your remote users and the office can be accelerated improving efficiency of mobile users.